Since January this year, two of our most experienced and talented needlewomen, Diana Adams and Annette Hughes, have been working on the repair and conservation of the Mothers’ Union banner for St. Peter’s Church, Barford. The work included replacing and reworking areas where the threads had rotted beyond repair. After 79 hours of painstaking work, the banner was completed in July and a Service of Re-dedication was held at the Church in September. The Arts Society Volunteers and Heritage Co-ordinator were invited to join members of the Mothers’ Union and the congregation, when the banner was paraded for everyone to see. Diana and Annette were presented with bouquets containing flowers of blue and white, the colours of the Mothers’ Union. 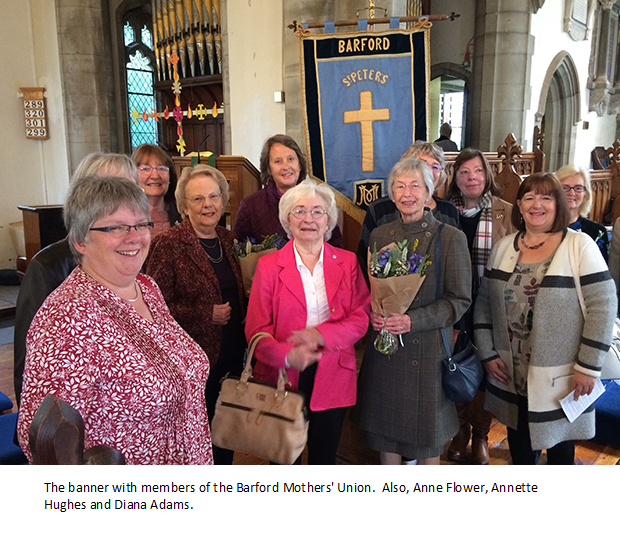 It was a special occasion because the Mothers’ Union members were delighted to have their banner repaired. One of them mentioned that the last time they had paraded it, they had felt like the poor relation because of the state it was in, but now they could parade it proudly. In March the Society was approached by the new Master of the Lord Leycester Hospital in Warwick, Heidi Meyer, for help in conserving six William Morris Wall hangings currently in the 13th Chapel. The Chapel was damp and the plaster was flaking off onto the hangings. The Master was anxious that they would disintegrate further if no action was taken. 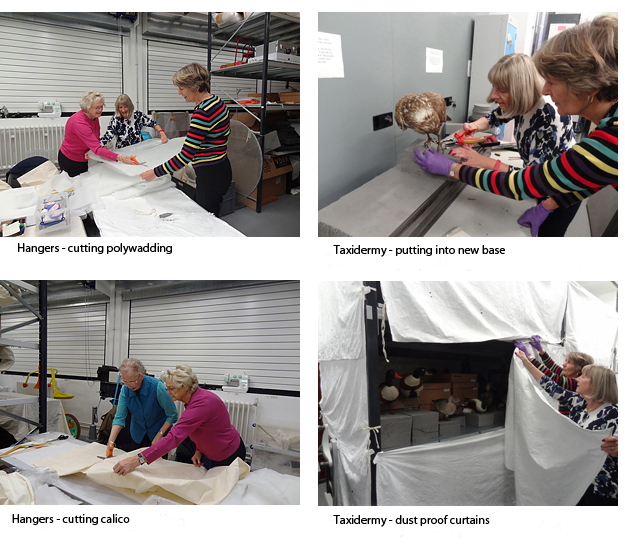 A meeting was held with Victoria Allan, Textile Conservationist, who examined the hangings and recommended that they were surface cleaned and packed for conservation storage, with a view to re-examining them at a later date. Three of our Volunteers, Janet Ainley, Ruth Barton and Anne Hayward set to work under the guidance of Victoria, and, over the course of three weeks, the hangings were cleaned and safely stored. It is hoped that it will be possible to display some, or all, of the hangings at a future date. Our team of 4 volunteers are now entering their eighth year at the gallery. During this time they have condition checked, recorded, photographed and repacked the Textile Collection and the Ethnographic Collection. 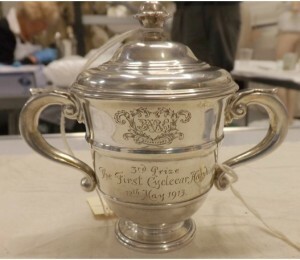 They are coming to the end of the Social History Collection, a large collection including many items of local interest. When this is complete they will return to the Textile Collection which, after 5 years, will need to be revisited. Hundreds of artifacts have been checked and the two and a half hours spent every Monday morning are still much enjoyed by the team. Volunteers worked on a large collection of Historic Motoring/Transport Trophies, the earliest was 1797 a Coach not a Car! The entire collection was to be exhibited at The Coventry Transport Museum unfortunately it appears that funding has placed a stop for the moment on this project, but as you can see we did as always bring these exhibits back to life. 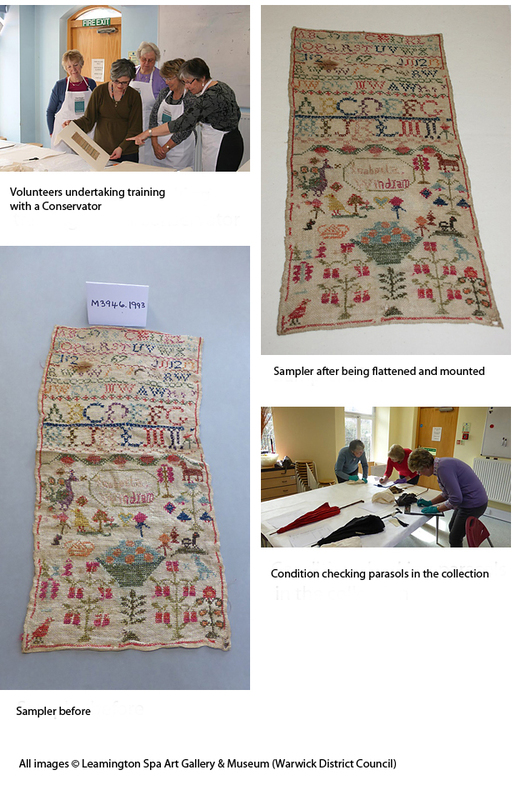 The Herbert group has finished off a series of projects including making exhibit covers/curtains for the Natural History store, improved padded coat hangers for the dress store and making cushions to support books when they are accessed from the collection. The museum displayed an exhibition about Children’s Television from the 50s onwards. We helped out with the ‘Hands on’ artefacts for pre school visitors based on the ‘Rainbow’ theme – lots of tactile clouds, rainbow banners and filling huge floor cushions with polystyrene beads -which is a whole story in itself ! Future activities may include making further calico bags for parasols and swords and checking and amending computer records of the collection. The group examined over 100 uniforms for damage, vacuumed them carefully and replaced them in custom made covers. As these uniforms are mainly red they are particularly prone to insect infestation so regular cleaning and careful storage are very important. The group also checked and updated all records related to the uniforms. 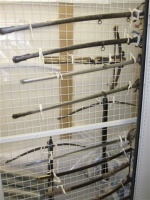 Our weapons Group, having previously worked both at the Lord Leycester Hospital and at the Royal Regiment of Fusiliers Museum at St Johns, Warwick, have also recently completed a project for The Herbert Gallery at the Guildhall in Coventry. The group received further training from Gallery staff in order to complete this project. The two completed chasubles were on display at the 2011 Annual General Meeting. A white one lined in gold with patchwork embellishments and a purple one made to the same design now grace the services. The vicar Reverend Craig Groocock was delighted with the results of Annette and Helen’s hard work.